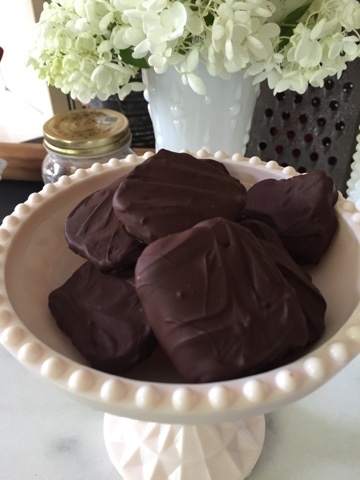 Today's chocolate indulgence are these vegan chocolate peppermint cookies. The cool blast of peppermint in my mouth is just what I need right now during this horrible heat wave we are experiencing. Cream the butter, sugar, and extracts until smooth. Add nut milk and melted chocolate chips, continue to mix until smooth. Add the flour, cacao, and baking soda. Roll the dough into a log about 1 1/2 inches wide. Wrap in parchment paper and freeze for 30 minutes. Place the wrapped frozen dough on a large baking sheet. Unwrap the dough and lay the parchment down so it covers the entire baking sheet. Start slicing the dough into 1/4 inch thick rounds. Evenly distribute the rounds on the cookie sheet. Bake cookies for 12 minutes. Cool on a wire rack. While cookies are cooling, melt chocolate. Remove from heat and stir in peppermint extract. Place one cookie at a time into the melted chocolate. Flip the cookie with a candy fork or a regular fork. Make sure both sides of the cookie are well covered with chocolate. Place cookie on lined baking sheet, continue with the rest. I place my cookies in the freezer for 10-15 minutes to help speed up the setting time. These chocolate peppermint cookies can be left out in a covered container, or for a real cool treat store in the freezer. Sparkling tea looks very classy in a glass, don't you think? I love the light and rosy colors sparkling in the sun like stained glass. 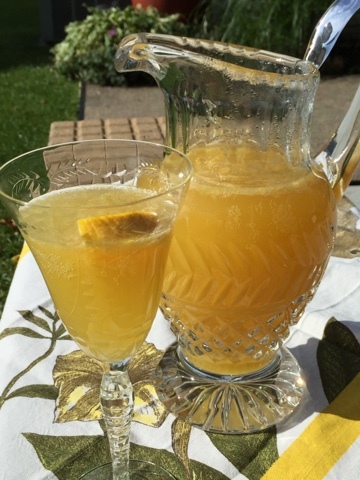 This sparkling tea is made with organic Yerba Mate which is naturally caffeinated and contains 24 vitamins and minerals; it also has 15 amino acids and is full of antioxidants. This tea is refreshing and bubbly! Combine juice and sugar into a small saucepan. Bring mixture to a low boil, stirring occasionally. Cook for 5 minutes or until sugar has dissolved. Steep tea for 10 minutes. Place tea in a large glass pitcher and let cool completely. Pour cooled simple syrup into the cooled tea, mix well. Add sparkling water and stir again. Pour into glass and garnish with orange slice. Some people may turn to an expresso in the middle of the day to give themselves a boost of energy. 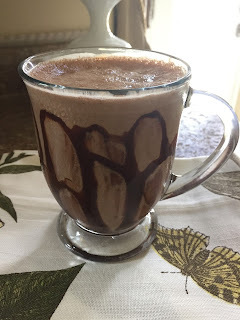 My shot of energy comes in the form of cool, creamy, and decadent liquid chocolate. Freeze any leftover you may have and now you have a frozen malted. Place all ingredients (except the chocolate sauce) into a high speed blender, blend until totally smooth. Now the fun part, grab your chocolate syrup and squirt all around the inside of a large glass, pour in smoothie and enjoy!! My daughter and I were recently shopping at our favorite outdoor mall. Our first stop was the LUSH store; gotta get there before it gets too crowded! We had a very pleasant conversation with the manager and other employees about vegan beauty products, vegan food, and vegan restaurants. After LUSH we proceeded to our other favorite stores. At this mall they have a very large 2-story bookstore. I really don't go for the books, I go for the magazines! They carry a huge selection, it's very overwhelming. I mostly look at two sections, food and home. When my daughter and I walked up to the food section, I noticed the word vegan, but not in a familiar font. We all know the vegan magazines, don't we? I was thinking this must be a new magazine. I reached for the magazine and when I pulled it out, I gasped! My daughter grabbed my arm and we both looked at each other in amazement. A new vegan magazine! And it's from the UK! I love UK magazines! The full name of the magazine is, Vegan Life. We found the current issue, which was just their sixth issue. This magazine is amazing, the paper used is of a nice medium stock. Vegan Life has done the vegan lifestyle proud. Refreshing recipes, meaningful articles, and vegan news from around the world. I have already bought the other 5 issues on download and am so excited to read them all. My daughter started reading the magazine on the drive back home. She found a recipe she wanted to try, so we made this delicious tofu bowl for dinner that night. 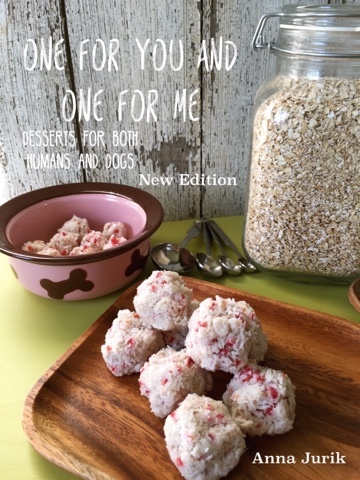 A huge thing I've noticed with their recipes is the ingredients are simple; I don't have to run to the store first, rarely do I find a recipe where I have every single ingredient already. The next time you are in a bookstore I highly recommend getting this magazine. Or simply purchase it on-line, that way you can also get the back issues. 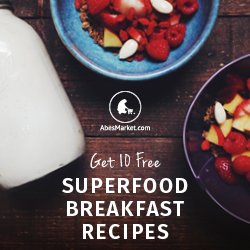 Combine all ingredients in a small blender or use an immersion blender. Blend until smooth. Heat oil in a large skillet over medium-high flame. Add tofu and cook until all sides are a golden brown. Transfer tofu to a bowl. In the meantime cook your rice. Sauté the brussel sprouts or broccoli for a couple of minutes. Add 1/4 cup broth, stirring to combine. Add a lid to the skillet and cook for 4 to 10 minutes, until the vegetables are tender and the broth had evaporated. Cooking time will depend on if using sprouts or broccoli. Add remaining 1/4 cup broth if the vegetables aren't tender enough, and continue cooking until tender. Remove from heat. 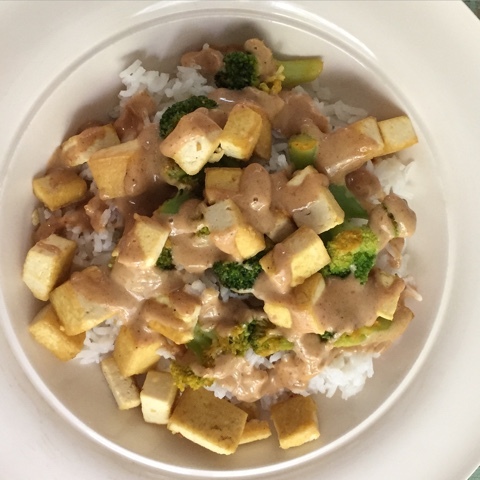 To serve, place 1/4 cup of rice into each bowl, and 1/4 of the brussel sprouts or broccoli on top and 1/4 cup of the tofu. Drizzle dressing on top, add a few drops of Sriracha if desired. Serve immediately. This smoothie has to be enjoyed using a spoon. 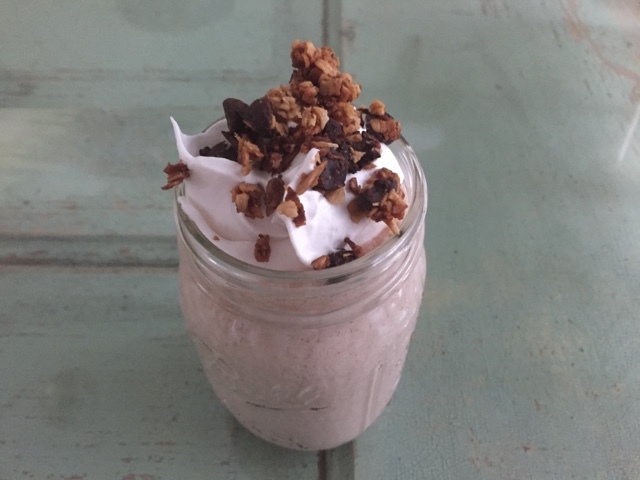 Crunchy, chocolate chip and almond granola is mixed into the smoothie, and then topped with whipped cream and more granola. Make a monster batch for your next party! Place hemp milk, bananas, water, and nutritional powder into your Vitamix. Process until smooth; pour smoothie into a large glass. Gently mix in 3/4 cup granola; top with whipped cream and remaining granola.